It is well known that styles of art are influenced by the availability of different kinds of materials. According to this page "Impressionism would have been impossible without this full spectrum of pigments packaged for the first time as oil colors in tubes." The work of the North Country Academy for the Excruciatingly Fine Arts was affected dramatically by the introduction of Colorix Silky Crayons which we received from our Grandma Mimi for Christmas. These Crayons apply very smoothly and leave thick, saturated colors, ideal for the expression of powerful emotions. 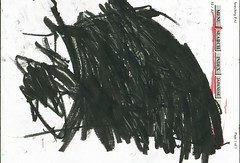 Shockingly, the artist C. Loftis gravitated immediately to the black crayon, and, appropriating some scrap paper from a printer, produced this dark, savage work. The violence of it--on Christmas day no less--amazes, as does the interplay between the animal scribbles and the cool logic of the appropriated computer waste product. The work seems to say, "We who live on the fringes of post industrial society, who survive on scrap paper and bile, we can only spit upon your off-center menu options."